Ten years have passed since the Great Tokyo Earthquake, and the people's memories of the disaster have faded. Santa Igarashi, a middle school evacuee, has finally begun to live a normal life...that is, until the day 'Red Man' appears at his school and Ganta's fate is changed forever. After re-reading the Goodreads description, I realize that it doesn't tell you anything about this particular manga. Here's what you need to know. 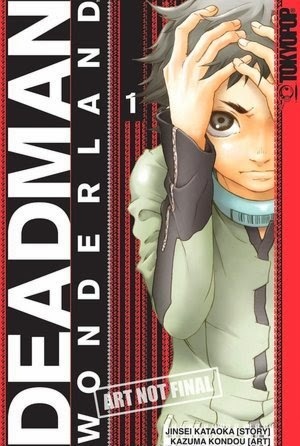 Deadman Wonderland is a prison, well, part prison, part totally messed up theme park. Inmates are pitted against each other in cruel battles that are televised to the rich who enjoy the sport. So throw a little Gladiator in for good measure. Santa, a middle school student, has been convicted of murdering his entire class and is now a prisoner at the infamous prison where he discovers that a special ability was transferred to him during the ghastly attack at his school. A crystal imbedded in his chest gives him the power of a Branch of Sin which enables him to shoot blood out of his palms like bullets. Next thing he knows, he's in the middle of the "Carnival Corpse" the game that pits Branch of Sin powers against one another. There's a whole lot more that's happening behind the scenes...a mysterious girl from Santa's past has found him in the prison, a revolution is brewing to help the inmates escape, a rather wackadoodle Warden who is bent on profit. It's kind of exciting, kind confusing, and kind of addicting. I couldn't stop reading once I had started, and it was a great distraction at the end of the year when I just wanted to read for amusement. Santa is a vulnerable kid stuck in an adult's world, but he starts to embrace his new powers and is bent on revenge for the massacre at his school. Shonen fans who aren't afraid of a little fighting should consider checking this one out. "Nobody living can ever stop me"